I was really busy and didn’t have time to go to the store this week so I checked out what was in the pantry. We actually had everything to prepare dressed-up Stovetop stuffing but it was late so I thought I would just make it at work the next day. How hard could this be, right? Turns out, it was a piece of cake! This is what you need: hot water kettle (I ❤ my Bodum electric kettle), measuring cup, cutting board, knife, two boxes of stuffing mix (whatever flavor you like best – I used herb flavored), two apples, one red onion, 4 slices of turkey bacon (which Artie kindly cooked for me while he made the coffee in the morning), a bag of dried cranberries, and a big bowl. I know it sounds crazy, but this was a cinch! Sorry the pictures are so blurry – I was using a point-and-shoot camera and trying to document the fun while cooking. Add the contents of two boxes of Stovetop to a large glass bowl with a lid. 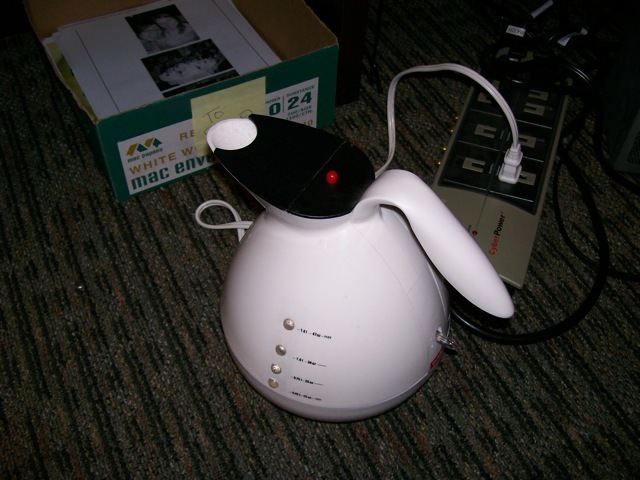 Boil 3 cups of water in the kettle. While the water comes to a boil, dice two apples (I used Honeycrisp – my favorite), half of a red onion, and four strips of cooked turkey bacon. 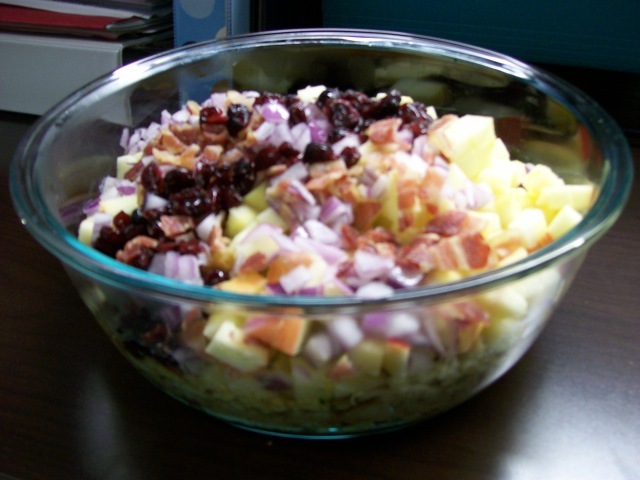 Add the chopped apple, onion and bacon, along with a generous handful of dried cranberries, to the stuffing mix. Pour three cups of boiling water on top of the stuffing, fruit, and bacon. Stir to combine. Cover with a lid and let sit for five minutes. Stir again. Serve hot as part of a delicious holiday feast. I forgot to add the butter (each Stovetop recipe requires 1/2 a stick) but I found that the flavor was fine without it. I did add a small pat when I reheated the leftovers and it provided richness, but with all the mix-ins, it really wasn’t missed. If you don’t like the flavor of raw onions, leave them out or saute them in olive oil before adding to the stuffing. Ditto to the apples – they got softer as I microwaved the leftovers, and I personally enjoy a little bit of crispness, but you could cook the apples before adding them to the mix, if you were making this recipe at home.